I loved this app since it was so easy to transfer files to my phone without ever having to connect it to my computer. I got a new phone recently (Note 8) and now I cannot transfer files to my PC. I can send files from my PC To my phone but not vice versa. I looked through most posts relating to my error "Local transfer failed" but they were of no help. I have Windows 10 but it was working fine on my older phone (Galaxy S7). I can send messages from my phone to my PC but I can't send files. I have tried everything from port forwarding 8888 to completely disabling my firewall and it still won't transfer. I tried looking for the logs as you posted in your FAQ but I couldn't find them. I have attached some pictures of the error. Also I can no longer drag and drop photos from my PC to my phone's Airdroid window. I'm hoping you can help, thank you! Would you like to check if your connection mode is remotely when you are transferring? If yes, when you transfer files or photos from phone to computer it will prompt "Local transfer failed and try remote transfer". You can click "OK" and files and photos can transfer to your computer but you should download them within 7 days. I can send files remotely but the reason why I got airdroid was to be able to send the files directly. It was nice not having to download the files. At that point I might as well just connect my phone to my computer and drag the files out. It used to work but now it doesn't with my Note 8. 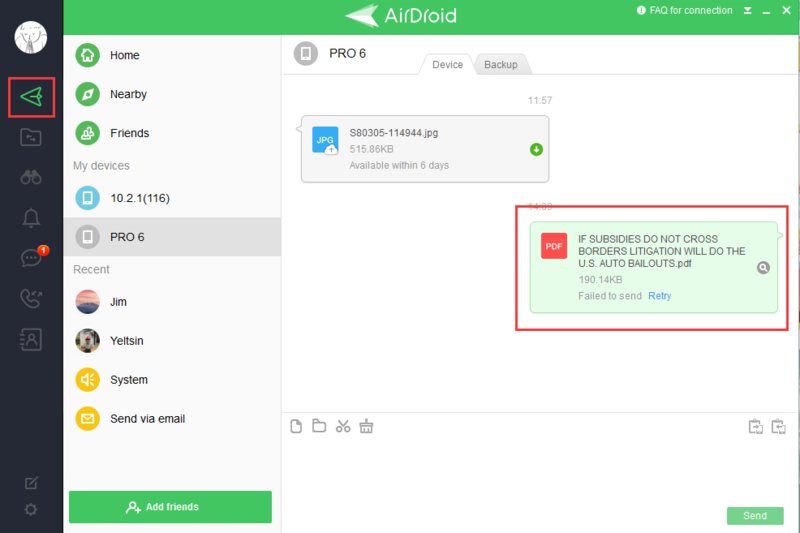 We would like to confirm with you that do you mean that you can not drag file to transfer to your phone on desktop AirDroid?